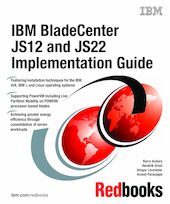 This IBM® Redbooks® publication provides a detailed technical guide for configuring and using the IBM BladeCenter® JS12 and IBM BladeCenter JS22 servers. These IBM Power Blade servers feature the latest IBM POWER6™ processor technology. This book teaches you how to set up the latest Power Blade servers to run AIX® , i, and Linux® operating systems in the IBM BladeCenter architecture. This book will be useful for data center system architects; network, storage and facilities engineers; system administrators; and application architects that need a detailed system bring-up guide and integration guide for IBM Power Blade servers hosting virtualized operating system partitions. We include procedures for installation and configuration of Virtual Input/Output Server (VIOS), Integrated Virtualization Manager (IVM), IBM AIX Version 6.1, IBM i 6.1 (i5/OS® V6R1), Red Hat Enterprise Linux, and SUSE® Enterprise Linux.